He was also the founder and chairman of Aquantive Inc., which was sold to Microsoft in 2007 for $6.4 billion in cash. Some of his other investments included Insitu Group (purchased by Boeing for $400 million) and Market Leader (purchased by Trulia in 2013 for $350 million). Needless to say, Nick Hanauer is a very wealthy man and a part of the top 0.01%. But even though he is very rich, he's much different than the plutocrats that dominate America today. Most of America's mega-wealthy oligarchs (who dodge billions of dollars in taxes, offshore millions of good-paying jobs and hoard trillions of dollars in profits in offshore banks) have hired journalists and economists to make their case that they can't afford to pay higher taxes or offer higher wages to their employees. But of course, one wouldn't know that judging by how they paid themselves. These ultra-high net worth individuals also give political candidates millions of dollars to make sure that their taxes don't go up — but instead, try to cut them even more. And some of these rich social psychopaths also want to eliminate the federal minimum wage altogether. Not to mention, weaken labor and worker safety laws, skirt environmental regulations and ban labor unions. The more radical among them would also eliminate the IRS (maybe to escape from being audited). But Nick Hanauer is much different. And unlike many of these other multi-billionaires, he doesn't consider himself a "job creator" per se. He reasons that if no one can afford to buy what he's selling, then the jobs his companies create will disappear. In his view, what the nation needs now is more money in the hands of regular consumers and more infrastructure investment. That's why he advocates for raising taxes on the super-rich and hiking the minimum wage. He also thinks that American corporations should stop manipulating their stock prices just to further enrich the top 0.01% (as though they weren't already rich enough). In a recent interview at Bloomberg, Nick Hanauer notes (4:10 into the 7:23 video) that in 1982 Ronald Reagan put a Wall Street CEO in charge of the SEC who changed the rule that allowed publicly traded companies to buy back their outstanding shares of company stock. Before that, it was considered "stock manipulation" — and illegal. That SEC rule change coincided with stock-based compensation for company executives, when the single-minded goal was pumping up stock prices. These execs would write pay packages for themselves (almost everyone on the board of directors) that included stock-options grants — and then followed this up with large stock buy-backs. Nick Hanauer said to help solve this, the rule should be changed to give incentives to companies to reinvest in R&D, employees and company expansions — rather than just incentivize companies to enrich their biggest share holders — such as company execs and institutional shareholders. (But as Rolling Stone pointed out in 2013, when Obama appointed Mary Jo White to be the director of the SEC, it was like putting the fox in the hen house). * Under the Securities Exchange Act of 1934, large-scale stock repurchases can be construed as an attempt to manipulate a company's stock price. In November 1982, however, SEC Rule 10b-18 changed all that. The new rule provided companies with a safe harbor that assured them that manipulation charges would not be filed if each day's open-market repurchases were not greater than 25% of the stock's average daily trading volume for the previous four weeks and if the company refrained from doing buybacks at the beginning and end of the trading day." * Section 10(b) is codified at 15 U.S.C. § 78j(b) — Rule 10b-5 has been employed to cover insider trading cases, but has also been used against companies for price fixing — artificially inflating or depressing stock prices through stock manipulation. In his interview at Bloomberg (video below) Nick Hanauer explains why wages need to be higher: to drive consumer demand, to drive U.S. economic growth, to drive American companies to expand their businesses — rather than just artificially pumping up their stock prices by buying back company shares. The Economist: "The companies in the S&P 500 index bought $500 billion of their own shares in 2013." Bloomberg (2014) S&P 500 Companies Spend Almost All Profits on Buybacks: "They’re poised to spend $914 billion on share buybacks and dividends this year, or about 95 percent of earnings." * About 27 percent believe that in two years their firms will be more reliant on part-time work compared to before the recession. * About 7 percent do not currently have an elevated share of part-time employees, but believe they will in two years. * About two-thirds believe their share of part-time will be roughly the same as before the recession. * Only 8 percent believe they will have less reliance on part-time workers compared to before the recession. "Low sales growth and an ample supply of workers willing to take part-time jobs could both be viewed as cyclical factors that will dissipate as the economy further improves. Meanwhile, higher compensation costs of full-time relative to part-time employees and the role of technology that enables companies to more easily manage their workforce can be considered structural factors influencing the behavior of firms. Firms that currently have a higher share of part-time employees gave about equal weight to these forces, suggesting that, as other research has found, both cyclical and structural factors are important explanations for the slow decline in the part-time share of employment." 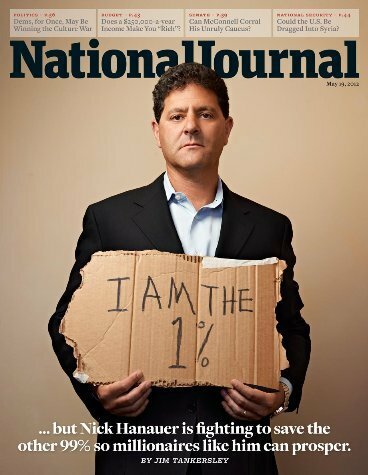 The National Journal: The 1 Percent Solution — "Nick Hanauer is the kind of innovator and venture capitalist expected to power the country’s next wave of growth. So why does he insist that only the fading middle-class can rescue America?" Also read Nick Hanauer's related post at Politico: The Pitchforks are Coming… for Us Plutocrats — "Seeing where things are headed is the essence of entrepreneurship. And what do I see in our future now? I see pitchforks." "Specifically, we find that making the rich richer by one percentage point lowers GDP growth in a country over the next five years by 0.08 percentage points—whereas making the poor and the middle class one percentage point richer can raise GDP growth by as much as 0.38 percentage points. Put simply, boosting the incomes of the poor and the middle class can help raise growth prospects for all. One possible explanation is that the poor and the middle class tend to consume a higher fraction of their income than the rich. What this means is that the poor and the middle class are key engines of growth. But with inequality on the rise, those engines are stalling. Over the longer run, persistent inequality means that the the poor and the middle class have fewer opportunities to get educated, enhance their skills, and pursue their entrepreneurial dreams. As a result, labor productivity and growth suffer." If one puts cash in the pockets of especially the poor, they spend it (not save it) thus adding to consumer spending which in turn boosts GDP. The current trend in how CEOs are paid, particularly with stock options, creates a range of economic problems. Several studies show that equity-heavy pay, because it makes executives very wealthy very quickly, distorts CEOs’ incentives, inducing them to take on too much risk. Instead of bearing this risk themselves, they shift it onto the rest of society, as we saw during the financial crisis. This model also encourages executives to behave fraudulently. In order to issue stock options to top executives while avoiding the dilution of their stock, corporations often divert funds to stock buybacks rather than spending on research and development, capital investment, increased wages, or new hiring. To top it all off, these pay packages cost taxpayers billions of dollars due to the performance pay tax loophole instituted by President Clinton. A high degree of economic inequality precipitates financial instability because it leads to, for example, a decline in consumer demand, which has tremendous spillover effects in terms of investment, job creation, and tax revenue, not to mention social instability. The growth of executive pay is a core driver of America’s rising economic inequality.